Meetings between Sergei Lavrov and William Hague seem to indicate a new phase in Russo-British relations. It may not be a breakthrough, but the existing problems between Russia and the United Kingdom brought about by cold wars and mutual distrust are no longer taboo topics. On his first official visit to London last week, Russian Foreign Minister Sergei Lavrov closed the books on an era of frosty political relations with Moscow that had characterized Tony Blair’s time as prime minister. The thoughtful and intelligent views of British Foreign Secretary William Hague, whose wisdom has been polished over the years by multiple political battles, have replaced the hot-headed and often impulsive nature of his predecessor David Miliband, who came across as wanting to teach Russia British common sense. This by no means implies that London has surrendered its positions in favor of restoring a dialogue with Russia, but Hague vividly demonstrated his country’s ability to transform quickly during Lavrov’s visit. Such transformations are being seen not only in the economy, where Prime Minister David Cameron is carrying out large-scale reforms, but also in foreign policy, where it turns out that London can nevertheless hold a constructive dialogue with its more complex partners without ditching its principles. Commenting on their meeting, Hague said gradual progress was being made step by step. This measured Russian-British forced march, void of any bravura, has shown the first signs of paying off. The previous approach of simply marking time and only giving the illusion that progress was being made has come to an end. The work the two ministers put into a joint statement on Afghanistan, which was passed on Lavrov’s visit to London, demonstrated that Downing Street and the Kremlin can achieve results when there is strong political will. What made the situation unique was that there were roughly six points of contention on the joint declaration when the two foreign ministers sat down for talks, but Lavrov and Hague insisted experts involved in the negotiations find a compromise in an hour. Amazingly, 60 minutes was long enough to fully resolve all the disputed issues. It appears there has also been a shift in London on another issue that long remained contentious under the previous British government: cooperation between intelligence agencies in the fight against terrorism. The British Foreign Secretary confirmed this was one of the main subjects discussed at the talks. The two men agreed in principle to exchange experience in such delicate matters as security for Olympic facilities. Hague was slightly evasive in his reply about when such cooperation would begin, saying only that the appropriate services would think about how to establish such interaction, but it was still clear the foreign ministers had reached a mutual understanding on this issue. The missing link appears to have been found in the Russian-British agenda, despite its relative brevity at first glance. 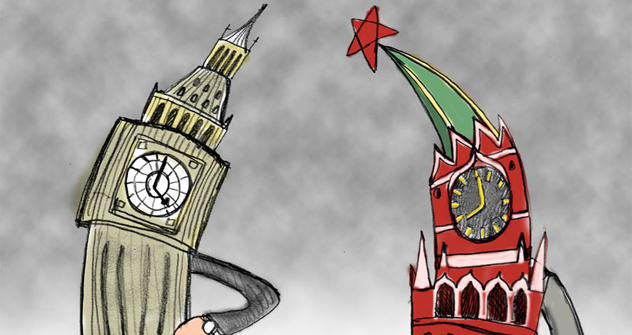 The lack of such a link, which could be described as tolerance for different viewpoints, had hampered the dialogue between Moscow and London for several years. In addition, the two men did not shy away from controversial issues that could have put a damper on the atmosphere during the talks. On the contrary, Rossiyskaya Gazeta learned that Hague reminded Lavrov about the situation involving a Guardian newspaper correspondent who had been unable to enter Russia because of technical problems. The Foreign Secretary thanked his Russian counterpart for his efforts in resolving the problem. Hague also expressed gratitude for the Russian security services’ actions to provide consular and medical assistance to British citizens injured during the January terrorist attack at Domodedovo airport in Moscow. Taking questions from students at the London School of Economics, Lavrov mentioned on several occasions that Russia was prepared to involve all of Europe in its modernization programs, with particular emphasis on innovative sectors of the economy. These programs, to be called “A Partnership for Modernization,” would be extremely important for the European Union and its key members amid the global economic crisis, Lavrov said. In this regard, the minister noted that Peter the Great had also attached great importance to co-operation with Europe in the development of the Russian state 300 years earlier. Overall, the sides can pride themselves that thorny issues were discussed, including the Mikhail Khodorkovsky case and UK moves to deport Russian citizen Yekaterina Zatuliveter for alleged spying, without harming or altering the two sides’ conceptual approach, whether for these negotiations or future ones. This approach can basically be summed up as Moscow and London finally being united in the understanding that existing disagreements should not hamper areas where they capable of co-operating.